Tree-Ring Chronologies and Mixed Conifer – Chocolate and Peanut Butter? Last week I allowed myself a few moments of respite and managed to develop a standard tree RWI (ring with index) chronology (and resulting residuals) for the Black Mesa site near Payson, AZ. I used dplR and R and the expreience was awesome. Beginning to end, the whole exercise took maybe 10-15 minutes, and thta includes figureing what format best fit our data. 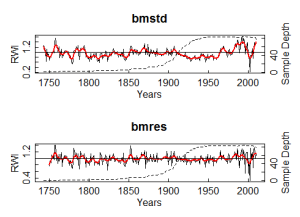 The resulting figure(s) show a smoothing spline (red) to highlight high-frequency (decadal) variability and the sample depth (dashed) is plotted on the right-hand axis; but the best part is the two harvests (releases evident in 1960s and 1980s) stick out like a sore thumb. 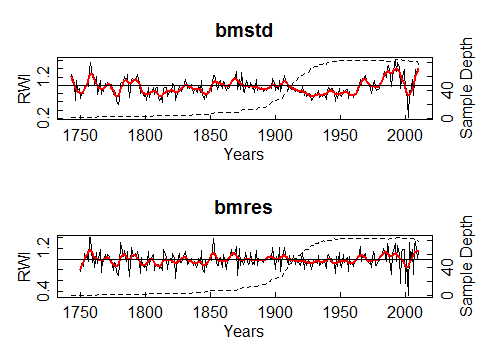 However, now I find myself wondering if these data also happen to capture the recent moratlity (post-2000) event observed throughout western forests and how hard would it be to remove the local climate effect…?